Around the world in 40 years . . . Part 18: Where East meets West | A balanced diet . . .
Byzantium. Constantinople. Istanbul. The bridge connecting Europe and Asia. Gateway to the East or the West, depending from which side of the Bosphorus you look. An ancient city, capital of the Eastern Roman Empire. Fought over for millenia, before falling to the Ottoman Turks in the 15th century. Where religions meet, and Islam became the dominant force. The Bosphorus Bridge, opened in 1973. Two more bridges have now been added, and a tunnel under the Bosphorus. I once spent a whole day in Istanbul. It was late summer in 1978 or ’79, or thereabouts. I’d attended a meeting on potatoes organized by the International Potato Center’s regional office in Izmir, and was headed back to the UK to meet up with my wife Steph and daughter Hannah to complete our home-leave before heading back to our home in Costa Rica. I must have taken the earliest flight possible from Izmir to Istanbul. In those days, Turkish Airlines flew DC9s on many of its internal routes, and they were fearsome flights. Hardly had we left the runway when the cabin was thick with the smoke from dozens of foul-smelling Turkish cigarettes. (I’m a non-smoker, so any cigarette smells are unpleasant; these cigarettes were particularly so). A Turkish Airlines DC9 (with a Boeing 707 behind). And I think many of the pilots were ex-air force, given their propensity to ‘throw’ the aircraft around the sky. In those days the DC9 had one of the steepest rates of climb of any aircraft, and the pilots certainly exploited that performance. It was also not unusual for the pilot to deploy the ailerons at 20,000 feet, and the plane would drop like a high-speed lift. Talk about losing your stomach. Since my flight to London didn’t leave until the evening, I’d decided to take a tour of Istanbul. But for the life of me I can’t remember how this was arranged. I do remember that I had a taxi driver to myself all day, who picked me up at the airport, took me round the city, waited while I visited various attractions, and then dropped me off at the airport. Now whether this had been pre-arranged, or I just chose the first taxi I came across and negotiated a ‘tourist deal’ I simply cannot remember. Not surprising really, almost four decades later. There were three attractions I wanted to see: the Blue Mosque, the Hagia Sophia, and the Topkapi Palace. And any other views along the waterfront of the Bosphorus that would give me a good view over Istanbul. I was not disappointed. The Istanbul skyline, with the minarets of the Sultan Ahmed or Blue Mosque on the left, and the Hagia Sophia lower down to the right. 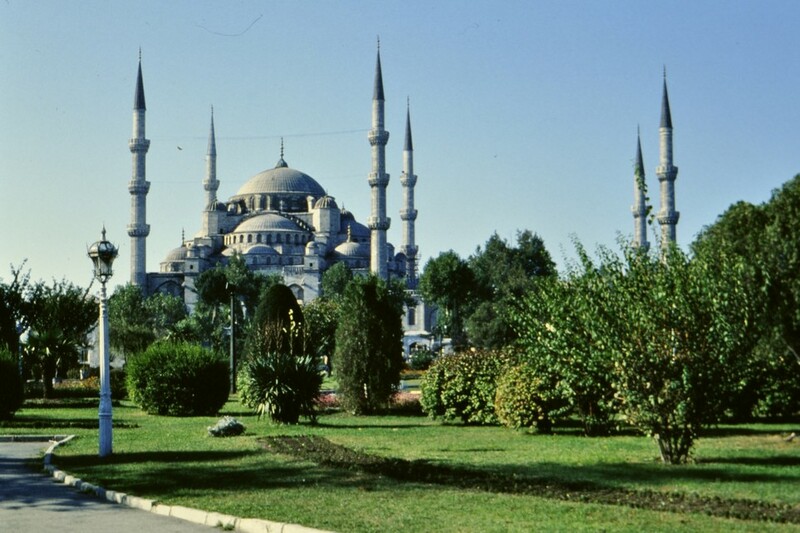 Taking in the Sultan Ahmed Mosque, also known as the Blue Mosque, dominates Istanbul’s skyline, with its six minarets. I find Islamic art and architecture very beautiful, and the interiors of the mosque are a joy to gaze at. It was built at the beginning of the 17th century during the rule of Ahmed I. Not too far away and closer to the shore on the northern side of the Bosphorus, the Hagia Sophia stands proudly, though not quite as grand as the Blue Mosque. 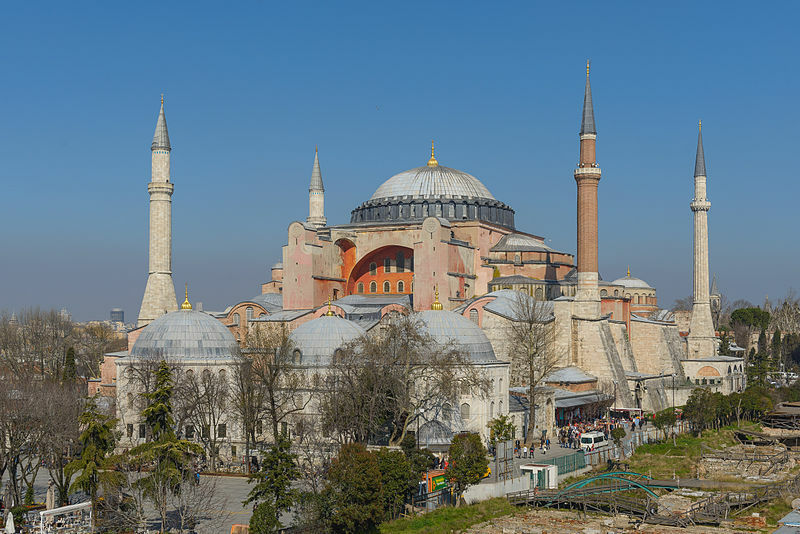 Hagia Sophia – Greek orthodox cathedral, mosque, and now a museum. It is more than 1500 years old, Hagia Sophia was the first Christian cathedral of the Roman Empire, became a mosque in the 1400s, and a museum in 1935. Rather plain on the outside, it contains some of the most beautiful icons and mosaics you can behold almost anywhere. They lift your spirit. I’m not a religious person (in fact, an enthusiastic atheist), yet I was moved by the spirituality of this wonderful creation. 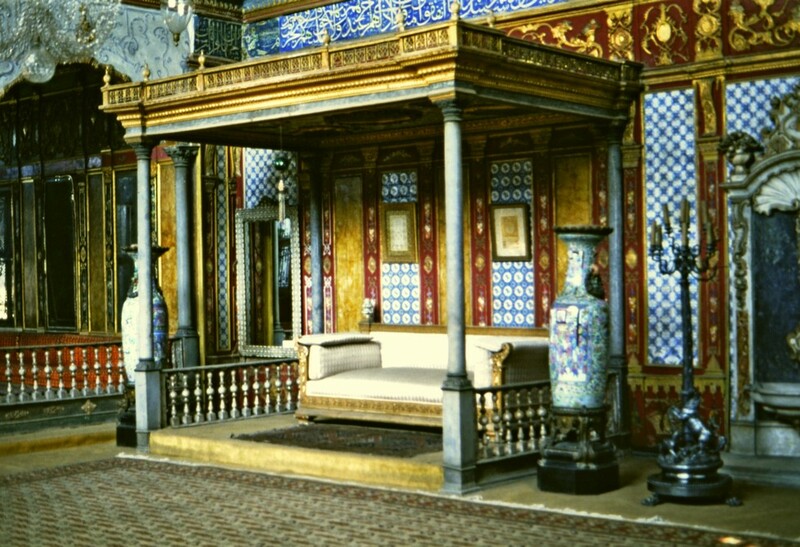 The Topkapi Palace, also on the north shore of the Bosphorus, was the administrative headquarters and residence of the Ottoman sultans. It was built in the mid-15th century. It’s now a museum, and houses many fabulous treasures. I don’t think I’ve ever seen so many large gemstones (diamonds and emeralds) as I saw on display there. And lots of exquisite porcelain from China. I have few photographs from inside. Then along the shore of the Bosphorus, as people waited for ferries across the water, or shopped for fresh fish, I’m sure the hustle and bustle today must be much more than when I spent one memorable day in Istanbul, taking in its centuries of Greek, Roman, Christian, and Muslim heritage. 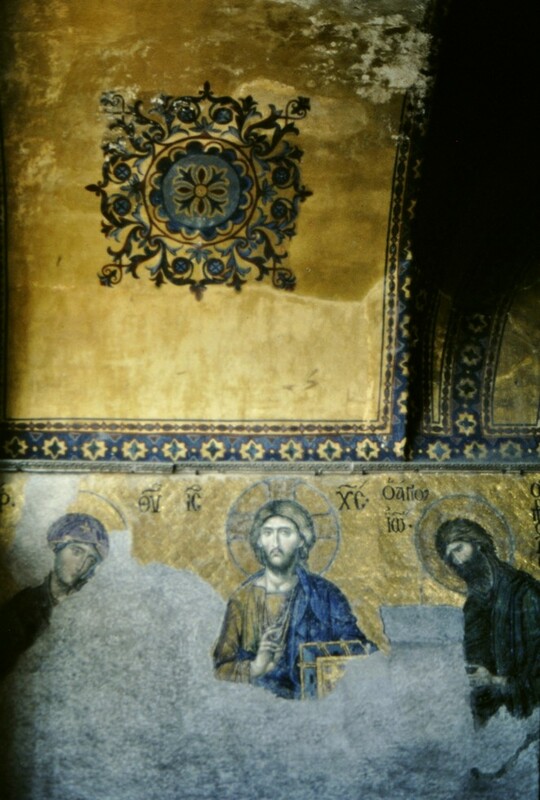 This entry was posted in Musings from the past, Out and about, Travel and tagged Blue Mosque, Byzantium, Hagia Sophia, Istanbul, Turkey.